Most individuals living in New Zealand may never have to face a life-threatening emergency. However, it is pragmatic to prepare your home and your car for large and small incidences. Small emergencies can include losing power, a loss of heating, or your car breaking down. Larger emergencies may include floods, fires, and pandemics. Stocking up on supplies and taking the right steps to adapt your home can make all the difference to your quality of life during emergencies. From lighting to home offices, so many aspects of our homes rely on electricity. Depending on the nature of your disability, power cuts can pose a threat to your wellbeing. Being able to mobilise with light, a clear path, and the contact details of your electricity company is essential. Prepare by having a torch available in an area you can easily access whether it is dark or light. In addition, you may want to consider installing batter powered lights on your walls and keeping candles. Fortunately, most emergencies around the home are small. You may find yourself losing heat on a cold day, for example. When such emergencies arise, your first priority is to stay warm. If you are in a wheelchair, keep a spare set of blankets, socks, and hats in a cupboard that is easy to access. Always keep your energy supplier’s contact details by the phone so you can contact them for updates. To make storing emergency supplies easier, you may want to consider adapting your kitchen so that surfaces and cupboards are lower. How well you need to prepare for a breakdown when driving depends on the time of year, and how long your journey is. Your biggest threat when driving is the weather. Temperatures are more likely to drop at night, so make sure you have insulating blankets in the car. For good measure, keep a first aid kit to hand too. Always make sure your phone is fully charged when leaving the house and have the contact details of a car rescue service available. Two of the biggest emergencies you can face in your home are fires and floods. When it comes to floods, Civil Defence may issue warnings well in advance. It is often the case that floods are featured on the news days before they begin, but Environment Southland is the site you need to turn to for in-depth information. The American Red Cross provides comprehensive information on preparing for a big disaster. One of their most important points focuses on establishing a personal support network. If mobility is challenging for you, being able to contact family and friends to leave your home as soon as you can is essential. When it comes to fires, prevention is better than response. Switching off appliances and making sure you turn off gas hobs after cooking is essential. Never leave food to cook unsupervised on a stove, as this is one of the leading causes of fires around the home. Always ensure your smoke alarms are properly fitted and working. It is surprising just how many environmental allergens can affect smoke alarms, so do check with the New Zealand Fire Service for a comprehensive guide to checking yours. Hopefully, you will never face a disaster in your home. However, preparing for one just in case is pragmatic. When you prepare for emergencies, don’t forget to let the rest of your family know about your plans. 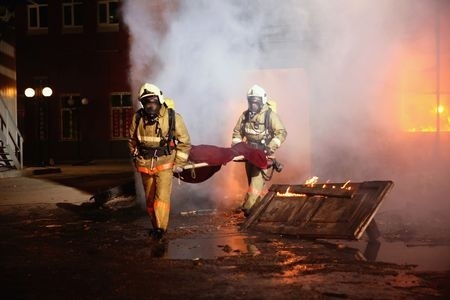 A shared rapid response prevents small disasters from turning into fatalities.